This rococo service from the period of Franz Anton Bustelli was the first "Electoral Court Service" by Porzellan Manufaktur Nymphenburg. Because fresh flowers were frowned upon as table decoration . they could wilt during the meal . Joseph Zachenberger created a colourful and festive design with flower bouquets, single flowers, butterflies and insects framed by fine golden edging in 1765. At the end of the 18th century, it was replaced as the court service with the Bavarian Court Service by Dominikus Auliczek. But it experienced a renaissance in 1913 when the service was reproduced as an extensive table service at the wedding of Ernst August, Duke of Brunswick and Laneburg, the son the last Duke of Cumberland, with Viktoria Luise, the daughter of the last German Kaiser, Wilhelm II. 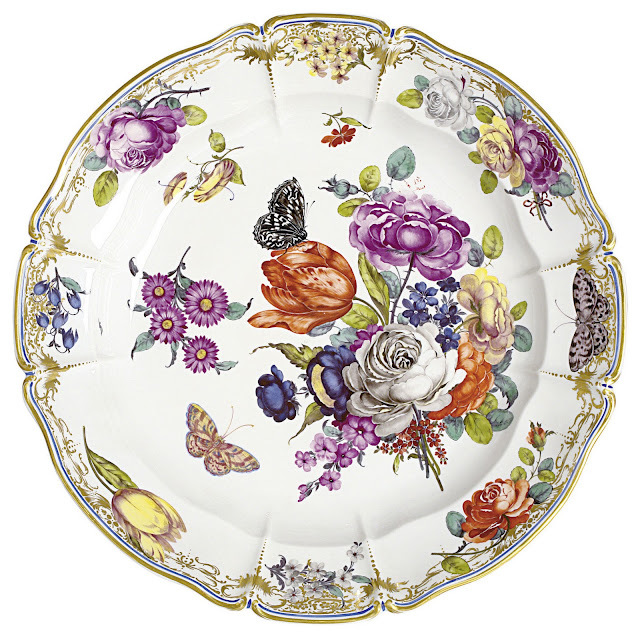 Cumberland bears the world's most complex flower design that is today still realized on porcelain: painters require up to three weeks to complete a single plate.